The Dreamland Theater has been designed to make movies and the performing arts accessible to all. Careful attention has been and continues to be given to ensure that all program areas of the theater are accessible. We place the highest priority on the comfort and safety of our patrons. 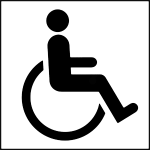 To this end, we recognize the needs of persons with disabilities, as defined by the Americans with Disabilities Act (ADA) of 1990 and subsequent modifications. In addition to the accessibility aids listed below, the Dreamland staff is at the service of patrons with disabilities and communication disorders. The Dreamland Theater is equipped with a barrier-free entrance and drop-off area. Two handicapped parking spaces are available next to the drop-off area. The Dreamland Theater offers accessible and companion seating in a variety of locations throughout the theater. Please inform the ticket seller if you need access to companion seating. An elevator provides access to the mezzanine level with additional companion seating for the Main Theater and to the second floor Studio Theater and Harborview Room and Terrace. Accessible bathrooms are located just off the main floor lobby and on the second floor. The Dreamland is equipped with the following assistive technology for the sight- and hearing-impaired. Equipment is available free of charge and is subject to availability. A proper form of identification will be needed to secure use and will be returned upon receipt of headset return. Headsets can be obtained at the Box Office. NOTE: Support for these devices vary with the featured film being shown, so check ahead should you require these assists. The Dreamland is equipped with an FM listening device that supports convenient, wireless equipment that helps to personalize the sound experience, so those who need extra assistance for any reason can hear effortlessly. The Dreamland is equipped with CaptiView Captioning. Hearing-impaired patrons will enjoy most first run Hollywood digital films with wireless, personal, in-theater closed captioning viewing devices. The Dreamland’s blind and sight-impaired patrons will enjoy many first run Hollywood digital films with the Dreamland’s Descriptive Video Service. This service provides narrated descriptions of key visual elements during pauses in the movie’s soundtrack through a wireless headset.